This post was originally written in November 2012, and updated in 2019 with new links. 2016 Update: I still love these necklaces, so I’m going to add them to our Workwear Hall of Fame. I have one in silver, one in gold, and one in rose gold, and wear one of them pretty much daily. They’re delicate, interesting, and pretty. That’s a really cute necklace! I’ve seen similarly interesting initial jewelry in Etsy recently too. Can we play the what are you wearing today game? I’m never wearing anything cute when it comes up but I really like my outfit today. I’m wearing a New York & Company pencil skirt in the color “black cherry,” a new black top with a ruffled front, a gray cardigan, and black tights. The ruffles are a new the for me and I think they add interest but are toned down a bit under the cardigan, which I have buttoned in the middle with 1 button. Ooh, I feel especially proud of my outfit today so I’ll play. I was in a weird mood this morning and wanted to feel okay with the world which apparently means tucking in my shirt. I’m wearing a lands end canvas button up in charcoal which fits perfectly but is quite masculine looking with a dark fushia wool pencil skirt, gray tights, and gray booties. I love the look of the quite severe top with the soft skirt. Oohhhh I like that! I’ve been interested in the mix between soft and severe and dressy and casual lately. I ended up ordering a sequin skirt and if it fits I’m thinking of pairing it with a plain black t-shirt that I recently got that fits perfectly. We will see if I can actually pull it off though! I love it. I am desperate for a sequin skirt but can’t justify spending more than about 20 quid on it. I have baby cheeks and wavy hair. I do more sturdy or severe tops with softer skirts and it helps balance me out a bit. I like this one in the pink or gray but am not sure a 12/14 is quite big enough. I’m also a bit afraid I’m going to love it so much and decide that sequins are appropriate for every occasion. I like it too and you’ll see why in a second! I ordered this one in the pink. I’m scared it won’t fit because they were out of XL so I went with a L but I’m between a 14 and 16 right now. Fingers crossed though! So weird! I came to ask styling advice for a floor length sequined skirt I bought today in black. It was such a good deal I couldn’t pass it up, but I can’t for the life of me figure out what to wear with it! La Redoute UK looks pretty good. La Redoute had online shopping in the U.S. for awhile, and then shut it down and re-opened it sometime in late 2011 (?). I recall that the stuff in the U.S. was pretty cheap, but also really crappy quality. The only thing I ever bought from them was the ruffley trenchcoat from the 2007 Christian Lacroix diffusion line. Maybe I need to revisit the rebooted La Redoute (US). I have this one from last year (DKNY makes one every year) and I got a 20% off coupon on top of it being on sale. I love it and wear it with everything from jeans to a pair of black velvet tuxedo pants! Just ordered the La Redoute one and somehow a collarless coat and colorful minis made it into my basket. My midweight winter coat hangs on me so it is somewhat justified but I’m also shopping my feelings at the prospect of missing Christmas with my family. (As evidenced by the John Lewis order made at 6am). I think that is perfectly fine justification! I hope the skirt works out and I’m sorry you don’t get to spend Christmas with your family this year. this sounds really cute actually – i love the color combination. and interesting necklines on blouses. I agree. I love navy with gold jewelry. Never considered the Lands End Chinos before. What style do you prefer? I hope not the one with the elastic waistband! I’m seeing fit 2 stretch in trouser, straight leg, boot cut and taper, and several others. Do you have a favorite? Your outfit sounds adorable, and I never would have considered most of what you’re wearing. Guess I’m in a rut! Flared taupe knee length skirt, chocolate brown sweater, a taupe scarf I got from my employees for Boss’s Day, brown tights and brown Mary Jane pumps. I think it is totally cute. I even had somebody stop me in the lunch line and compliment me on my outfit. If you need a great sweater check out this one from Eddie Bauer: http://tinyurl.com/Eddie-Bauer-Sweater I now own it in three colors. I’m wearing the Sam Swept Away Purple dress from Soma (black with purple flower), a charcoal cardigan, black tights, and black suede pumps with a patent X strap. I wasn’t feeling great this morning, but I had an 8:00 class so I decided to dress up a bit. Black ponte pants, black tee shirt black pumps and a hot pink cardigan- leaving early to travel and since the office was empty nobody cared! i love this game, even when i’m wearing lackluster stuff…like today. black v-neck ribbed sweater over a white cami, black/brown/gray/ivory tweed trousers, black pointy-toed pumps, pearl studs, rose gold MK watch, silver bracelet and necklace in a knockoff yurman style – three strands of large-link chains, some with cabling, and pearls here & there, actual yurman petite albion ring in blue topaz. i got this sweater about 8 years ago on super-sale, and every time i wear it i’m pleasantly surprised that it’s holding up so well – it’s aqua, from bloomingdales, and i think it’s 100% cashmere though it may be a blend. i got them a few years ago from one of those jewelry-party type catalogs – i think the style was “bella” or “bellismo,” maybe? just googled for a couple minutes and nothing was coming up, so they are probably long gone…sorry! and my winter staple purple velvet fringed skinny scarf. Accidental color blocking here: black a-line skirt, heather charcoal jacket with fun seams, double-pleated v neck top inpurple/magenta (the color of the purple heels yesterday), and leopard patent heels, with gold accessories and small pearl and gold earrings. I’m down to like, 4 outfits these days (happy 8th month of pregnancy), and I think I hate everything I can still wear, and OMG, why do I own so much black and gray? Gray pencil skirt and black with cream polka dots cowl neck top, both from Motherhood Maternity, patent black flats (I finally broke down and bought some flats – at least they’re patent and have a slightly pointed toe, but ugh – I never wear flats professionally. ), black tights (regular ones, with the waistband snipped, since I can’t for the life of me find a decent pair of maternity tights that don’t cost something ridiculous – honestly, Motherhood Maternity and Amazon charge the same for tights as they do for some entire dresses! ), ruby penant necklace and earrings. I had on a black blazer as well (non-maternity because why are these so hard to find in maternity?!?! ), earlier for court. Boring today. Camel-colored cowl-neck sweater and chocolate brown pants . Brown pumps. Plain gold huggie hoops. After I got to work I wished I’d put more thought into accessories. But I’m still having trouble deciding just what to wear with the sweater. Bracelet maybe? Not sure of the length/width of your cowl neck, but sometimes I pin a brooch on the cowl since necklaces don’t work. Deep red dyed freshwater pearls? I’m in love. I used to think that pearls were fuddy-duddy and then I realized that the clever use of color + structure can make pearls pretty darn awesome. Live and learn. A peplum top. Truth. The everything else is inconsequential. It’s starting to get really warm here in Sydney, so I’m wearing a black and white checked pleated skirt, black tshirt in silk, cobalt blue 3/4 sleeve cardigan and cobalt blue heels. I called in to see my law student daughter on the way to work and for once she was happy with the look!! I’m cute-ish today…black JCrew tuxedo pants with the piping down the side, and a white house black market cowl neck 3/4 sleeve white blouse with silver/white striping. It is my “dressed for office but pretty comfy” outfit! Black fitted sheath dress, bright yellow 3-quarter length slightly cropped cardigan (open), black CL simple 85 pumps, a kate spade statement necklace with bright yellow, turquoise, and white hexagon-shaped stones, oversized gold watch, and gold studs. Can you tell I’m in Texas and it’s still hot here? Bateau neck, sleeveless, knee length navy and white patterned sheath dress with navy heels and RED lipstick. It may seem summery but I live in the tropics! I’m a law student, so don’t have the same professional restrictions. Cream blouse, untucked, over orange miniskirt. Gray tights with a pattern, camel suede booties, gold hoops. Hooray! I dressed up in response to the icy, cold weather. I do that when sick too– it just seems to help. I think that was a tip from someone here. Scarlet red Tahari dress, black cropped Ann Taylor cardi, black hose, Nine West black patent pointed pumps with leather bows, and pearl necklace and earrings. I adore this, it’s so delicate and would look really nice peaking out under a top. Alas, my postgrad budget doesn’t extend beyond Accesorize and the Anthro sale rack if I’m feeling flush. I love it, too, and was thinking this would be a great holiday present for me to ask for, but I don’t love the way the letter that I would want looks. Hmm…. Same problem with my letter of choice, although I love the necklace pictured. I think I’ve loved all of Kat’s accessory picks. This is late but Albeit jewelry makes similar necklaces. I have an initial necklace from them that I have worn close to daily for the last year. You may like the lettering they use (block but delicate and modern). I prefer the scale of Albeit’s too — I think they’re a little bigger than this one! I love your handle. Thank you. Well, yeah, obvious typo by cb — why bother pointing it out? Ha! My spelling has gone to pot, all those undergraduate essays. It took me about 60 seconds to realize what I had spelled incorrectly. It happens to all of us, even without undergrad writing to have to read, and sometimes the typos are unintentionally hilarious (like Kat’s post mentioning a sale on “comfort hoes”) and we can have fun with them. But, anon, with all the talk about mean-girl snark lately, why make an issue about a little error like this? I really like this. 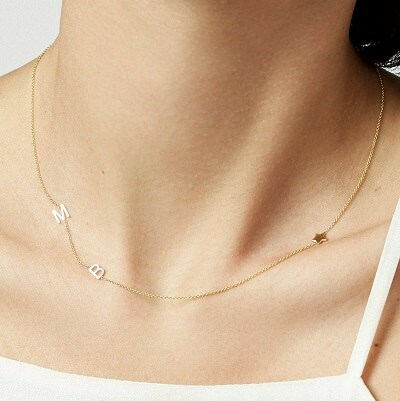 But I wonder if the letter part of the necklace would stay asymmetrical like in the photo or if the necklace would end up slipping down so that the letter was just handing hanging in the middle like a normal, non-asymmetrical necklace? My question, too. It seems like the weight of the letter would make it slip around. Still a pretty necklace, but not quite the same. Likewise. I wonder if the necklace has some sort of counterweight to keep it balanced? I have this problem with the clasps on delicate necklaces – I’m constantly adjusting them when the clasps slides down to the front. Does anyone know a way to prevent this? I hate to be fidgeting with jewelry, especially at work. Ditto. I’ve wondered whether I need to attach a little something to the clasp to weight it down and then position it at the back of my neck. Although it might just cause the clasp to always end up in the front. I get a D- in Jewelry Physics. I really like this. And speaking of letter/monogram jewelry, I just ordered a few of these as Christmas gifts for my sisters and I’m so excited to get/see them! I may steal this idea! What beautiful jewelry and I love the personal touch. I always want to buy from Etsy but get so overwhelmed by the options. If others have go to Etsy stores, please send along! Second – I always start browsing and am overwhelmed by a million stores that I just give up. I don’t have any go to stores, but I try to narrow down the description of what I want and then run a search for it and put the pieces that I like in my cart so that when I’ve seen a bunch I can go to the cart and do a better comparison and pick my favorite. I just did this for my sister’s birthday present and searched for “bow necklace” and found a bunch of variations that I liked. She posted a bunch of jewelry on Pinterest that was jewelry with metal charms that look like ribbons tied in a bow, so it helped with the narrowing down part. Oh, I hadn’t thought to look at what my sister had been posting on Pinterest for Christmas ideas – good thought! I made my sisters create Pinterest boards specifically for gift ideas and inspiration. It was super helpful! Very pretty. I have a necklace with a monogram like this and get compliments on it all the time. Super pretty! I’m sure they’ll love them. That necklace is cute, though I’m not one for wearing initialed stuff. Love this, and equally love the state charm! I already have an initial necklace, so I think I may just purchase the charm for my state (which by the way, is super cute). It’s nearing holiday tip time in NYC and I would normally tip a nice amount (now that I have a paying job), but lately the doormen have been REAL A$$HOLES about packages, to my visitors, etc to the point I don’t feel like giving them anything (and only nice cards with tip to the nice night guy and the porter who stayed the whole week during Sandy and who isn’t a jerk). Any suggestions/thoughts on holiday tipping? In MY BUILDEING, we do NOT tip doormen individuelly. Instead we give a gross amount into the BIG KITTY and the BIG KITTY is split between all the service peeople! This way everyone gets money, even if you were a doosh! We can always give SPECIAL gift’s. I bake FUDGE BROWNIES for the guy’s. They are so glad that I CAN BAKE! Yay! Did you tip last year? If yes, and they are jerks I can see lowering the amount. If you are new to the buildings I’d recommend paying it forward, tipping decently and hope the service improves. No tip will just reflect poorly on you, not them. Hmm. Thanks. I’m not new, but I moved in just after the holiday craze so this will be my first “holiday” in this building. Seems odd to me, too, but if it’s entered into the docket as “order granting a motion…” and is signed by the judge, I would say it was granted. Did the attorney accidentally sign their own proposed order? Don’t laugh, I’ve done it as I go through the pages and sign, but thankfully I’ve always caught it before it was submitted. In my area of law, the judge often asks the prevailing party who submits the order to have any parties who opposed the motion or appeared at the hearing approve the order as to form. So that may be why there is an attorney signature. Also, certain form orders have a space where the attorney submitting the order is required to sign it. The judge’s signature and seal mean the order was entered. Hey everybody, DH gave me the silent treatment all weekend again (8pm Friday til noon Sunday). I avoided him yesterday and today, and now I am ready to confront him about it. I plan to say something like, “So I see you’re not giving me the silent treatment anymore. Do you think that’s an appropriate way to treat me?” If he says yes, I’ll say thanks for letting me know, I’m not putting up with that so we have a different conversation to have. If he says no, I’ll say ok, you need professional help (preferably for an hour every week). I’m looking for your thoughts – how to bring this up, whether my starting line sounds okay, how to respond – and general encouragement since this is pretty awful to go through. Thanks in advance. IMO the starting line is hostile – not saying you don’t have a reason to be hostile (at all), just that he may not be inclined to then want to have an open and frank discussion. However, maybe I’m picturing the delivery differently than you are. I might start with, “Hey, DH. I noticed this weekend that you weren’t really communicating with me, and I’m sure it has to do with our disagreement/your anger at me on Friday. Were you expressing your anger that way? I felt like that was really hurtful, and I don’t understand why you treated me that way. Can we talk about this?” Then if he says, “I don’t care that it hurts you, that’s just how I treat you,” you have discussion A, and if he says, “No I kind of regret doing that, it was immature” you have discussion B. But I am extremely non confrontational and tend to approach things in a more roundabout way. So if that is not your style or what works for you, a more direct approach might be better. +1 on this approach, if for no other reason than you know that he is not reacting to HOW you say it, but truly the content. Agreed. And good for you for standing up for yourself and starting this discussion! Yeah, I think this sounds like a productive approach. Good luck, e_pontellier, and let us know how it goes. I hope things do improve with you and the DH. …check in with us tomorrow morning. Just so quell any worried auntie syndrome some 0f us may or may not have. And so we know how it goes — fingers crossed! This might be the nicest thing anyone’s ever said to me on this website. Thank you and I will. Hugs. I don’t remember all of the details of your husband’s communications issues, but I would be really angry by all of this. And I would probably be fairly direct, although calm. I think something like, “I noticed you were giving me the silent treatment this weekend. Were you angry at me? Why? What was the point of giving me the silent treatment rather than telling me you were angry at me?” You know how to approach your husband better than I do, though, so YMMV. Separately, have you and/or your husband looking into whether he falls on the autism spectrum? It seems like he really struggles with empathy and communication issues. I think I like this approach. I’m concerned that if I’m anything sort of FIRM toward him, I’ll chicken out before I say what I need to. My therapist & I have diagnosed my DH as narcissistic, OCD, pretty anxious, with a victim mentality. Pretty sure none of his behavior is malicious or he’s even aware of what he’s doing. I haven’t looked into whether it’s autism but it doesn’t seem to be at first glance. My husband used to leave the house, for an hour, for days and I would panic. He would occassionally refuse to speak. After many fights/talks, he said that he needs MUCH longer to cool down than I do. He now grumbles that he’ll be back on the way out the door. I stopped flipping out and he comes back a few hours later. Just knowing that he is just cooling down, and THAT HE WOULD COME BACK. was all I needed. Do you go on vacation with your husband? How do you deal with it when you’re not in a place where you have the things you need (e.g., food)? Do you have children? Just wondering how those things factor in for you. I’m so sorry. Honestly, I think whatever you want to say is justified here. I know that’s not what you want to hear, but I am just so MAD on your behalf. You deserve so much better and I’m glad you know that, but I am going to tell you again and again and again. You deserve better. This man is not better than you. I agree with eek. If it was the first time then maybe a less confrontational approach would work. You are justified to handle it however you feel. I’m thinking of you and hoping that the talk helps you know which direction to go. Also, don’t ask him if he intended to hurt you. From your follow up it sounds like you know he didn’t. Totally valid for you to ask him for some reassurances and some extra tenderness, though. Hugs and good luck. Hey everybody, had the conversation. It didn’t really go. DH just turned on the Knicks game. So, I have some thinking to do. Thanks for all your support. Just wanted to say I’m thinking of you, e_p. You are more patient than I, I probably would have turned the tv off or sat right in front of it and blocked the screen. Not the most productive reaction, but seriously?! I am your wife/SO, I’m trying to have a conversation with you about our relationship, and you are just going to turn on the game and pretend I don’t exist? No. Just no. MAYBE if he were a die-hard fan and you guys had a standing no-major-conversations-during-the-game agreement and he was otherwise reasonable to deal with, but even then… I’m so sorry you’re dealing with this, but I think deep down you know this isn’t fair to you and that you deserve better. I hope you guys come to a resolution that works for both of you. He did you end up approaching it? Maybe one of the other tactics is worth a try. Was the Knicks game part of continued silent treatment or just his way of saying he didn’t want to talk about that specific subject? Me: So I noticed you got really upset on Friday night. My weekend was really awful. Can we talk about what happened. Me: So is it something that I’m going to have to get used to or is it something I can help avoid? Other than these 2 points in our conversation, he was very supportive. I was far more assertive than I typically am; I was able to stand up for myself (which was great); and he was very apologetic even this morning. I’ve learned that he thinks the silent treatment is okay and he absolutely refuses to go to therapy. Given how he’s still completely obsessed with the marathon being cancelled, I think he absolutely needs therapy, but he’s made it clear that’s not happening. PS: neither of us are big basketball fans. I also don’t see how he was apologetic. Can you give us examples of that? If he absolutely refuses to go to therapy, what are you able to do to make the situation better for YOU? Because honestly, this is untenable. I am proud of you for standing up for yourself. It sounds like you have some decisions to make and I wish you all the strength in the world in making them. Marriages require hard work from both parties and I am sorry he is unwilling/unable to do what you and your marriage need. I’m glad that you were able to have some discussion about the other communication issues, but I’d be so frustrated that he refused to talk about the weekend. Did you at least find out what it was that set him off? How did you respond the the Ny Road Runners comment? From an outside perspective and with the time to take to come up with a response, I would have wanted to say something like “clearly you are upset about the marathon being cancelled and how it has been handled and I think it is a perfect example of why ignoring problems does not make them go away. You’d like the road runners to behave differently and I’d like you to behave differently and deal with this issue.” I know something like that wold be hard to come up with in the moment though. And I know that you know this, but I feel the need to point it out anyway, but being apologetic is part of the cycle of abuse. Agree with Sydney Bristow that you could use the Road Runners comment to show why it’s not a great way of handling a problem. So sorry you’re having to deal with this again. I have talked at length with my therapist about whether he’s abusive. We really don’t think he is – just selfish to the point that he’s unaware of what he’s doing to me. He did agree to discuss Fri night and then just stared at me. I did not find out what set him off, but a long time ago, he told me that he gets set off when I do something so stupid that it even makes him angry that I don’t know what I did wrong. I don’t feel like I did anything wrong at all, and if he’s going to stay angry about it, I’m not going to feel bad, but holy crap this is ridiculous. With the NYRR comment, I said, “I can’t tell if you’re being serious.” He said he was. I left the room (I had to take a couple of breaks from the whole conversation) and when I came back I said that I hope he knows we have a different relationship than the NYRR does with any one of its runners, and that I don’t really care how the NYRR handles problems, I’m telling him how I’m handling my half of OUR problems, and that’s really all that matters. He was a little better at that point. We talked about other things, like how I feel like I’m an interruption in his work day, and he apologized, said I’m not, and we talked about how he can actively do things to make me feel more loved (e.g., HE should call/text ME during the work day; HE should respond to my emails; HE should not leave the room when we’re having a conversation (he frequently walks around the apt when we’re talking)). I want to give this 4-6 months of this “new” fighting technique (where I actually stand up for myself) to see how this pans out and whether this is something I can live with. I know there’s a commenter who was able to get her DH to go to couples counseling even though he wouldn’t go to individual counseling and I’m thinking about trying that. I’m glad you are starting to stand up for yourself and I’m sorry you have to deal with this. Nobody deserves to be treated that way. For the record, aside from something like taking all of your savings in cash in an envelope to a bar, getting drunk, and forgetting it and then not understanding that you did something reckless, I cannot imagine something you could do that would be “so stupid that it even makes him angry that you didn’t know what you did wrong.” You are not a mind reader and it is really unfair for him to expect you to be. I’m sure you and most people can pinpoint things that they do or say that upset another person, even if it takes awhile to think about. Especially if it was so bad that the other person’s response is to give you the silent treatment. I want to cry for you. Nobody deserves that from their partner. Thanks Herbie. Yeah… I used to get really really upset but now I’m in therapy and if he has a problem, he can let me know what it is. Otherwise, he can get over it. 4-6 MONTHS is enabling. Why should he get to treat you this badly because he’s “selfish”? I know we’ve gone through this before with you, but if you are not acting like you deserve respect and compassion and partnership, it appears as though he does not think you deserve this (minimally acceptable) treatment either. I really hope that you are working with your therapist on your own self-respect and self-esteem issues. Low self esteem is one of the classic “symptoms” that go with domestic violence (which in your case takes the form of verbal abuse). Worried auntie tendency mollified. Thank you for checking in! I’m glad you were able to have an at least somewhat productive conversation, and wish you luck in working it all out. Thanks for checking in e_p. Like others, I was thinking of you all evening and am glad to hear you’re standing up for/taking care of yourself. Sending lots of hugs your way. Has anyone had any experience with weight gain while on an anti-depressant? If I do nothing differently, will the weight come off on its own now that I’ve been off the drug for over a month? Thanks! I did not lose the weight just by going off the meds. Hopefully, your experience is better than mine. First, thanks to the poster who mentioned last week that they were going to talk to their doctor about meds for depression, it was one of several things that pushed me to the point of actually taking the time to make an appointment for myself. I finally acknowledged that just barely being able to get out of bed in the morning and going through the day in a fog, and wanting to cry multiple times a day over stupid things is not normal or ok.
Next: question for the hive: during this extended bout of depression, I know I’ve screwed some things up at work. I’ve missed some deadlines and done some less than 100% work. Some of my teammates have taken up the slack, and we’ve been between bosses, so while I’ve kind of “gotten away with it” as far as not being repremanded, I suspect I’ve burned a few bridges with my coworkers or earned myself a (admittedly earned right now) reputation as a slacker. How do I handle this at work? Just try to get some treatment and do my best to get up to speed? Make a subtle “thanks for picking up the slack, I noticed and I’m working on it” comment to my coworkers? Talk to my new boss in case my coworkers go to him about picking up when I dropped the ball? Ugh, I just want to bury my head under the covers and hide, but that’s what got me into this situation in the first place. Overachieving chicks, have any of you been through this and how did you recover professionally? Last, can I just comment that our health system in this country is really screwed up, and the mental health system even more so? I have spent the last 2 days playing phone tag with doctors offices, insurance companies, our EAP system, etc to find someone who can see me, isn’t a 2 hour drive away and takes my health insurance. And since at least part of my anxiety/depression stems from feeling like there aren’t enough hours in my day to juggle work & family (and at this point I don’t actually have any friends that I see very often due to above time issues), taking this much time to just start this process has really stressed me out even more! No wonder people wait until the situation just gets too much for them to handle. So sorry to hear that you’re going through this. Know that you’re taking all the right steps to make yourself healthier and happier. If it were me, I wouldn’t say anything unless I felt like I really had to. It may just prompt questions and I definitely wouldn’t say anything about your depression–it’s your business and yours alone. Chin up–you’ll put out of this! Dude, hugs and rawrs. What you’re experiencing sounds so difficult and I went through something similar when I was drowning in allergies. It was literally like how you describe – living life in a fog. I had a private discussion with my supervisor and I outlined how I would specifically try to improve – he saw that I was struggling. His method of trying to help me was to supermicromanage me, which made me feel worse. We worked out a plan together and our professional relationship is stronger than ever. It also helped to receive appropriate medical care. For you, it doesn’t have to be as formal, since you have a new boss. Which is kinda great – your new boss knows nothing about you – fresh, clean slate. Soon after my new and improved moment, I switched to a new group and my new supervisor was VERY HAPPY with my work. For your teammates, maybe have coffee or lunch or a walk one-on-one and tell them you’ve had a rough time recently and you really appreciate their help and that you’re working to improve. People are generally understanding, especially when they feel like you let them in a little. I hope things improve for you. Keep looking for that doctor and/or therapist. I’m rooting for you. re: your coworkers, I’d say something along the lines of what you outlined. Maybe soften it a bit by doing it right after a project/deliverable/presentation they really helped out on (or even just did a great job on). Or bring in cookies for the group if that is appropriate in your office (it isn’t in my current one, but would have been in past offices). As someone who has been in your coworker’s shoes, I’ve ALWAYS grumbled (internally and/or to peers) about it right up until the “you” in the situation has acknowledged and/or fixed the slackerdom. But I respected those that owned up to it a lot more–if only because it shows that they weren’t totally oblivious. A simple “hey, I just wanted to say thanks for picking up the slack recently. I’ve been going through some personal stuff and I know I haven’t been on my A game. I really appreciate it. Happy Thanksgiving!” would go a long, long way with me. To the point that I”d go out of my way to help you in the future and CERTAINLY would stop grumbling. It’s a tough one. First of all congratulations for taking the first steps to get treatment, and best wishes. Secondly, there is no single right answer on how to deal with the impact on your work. You may be fortunate enough to have a great supervisor who will rearrange things for a period of time to take some of the pressure off you; or this may be completely impossible. I agree with Godzilla that you can probably let your colleagues know that you are going through a rough time and while you hope things will soon be on the mend you’ve been grateful for the times they’ve helped out. Once they know there is a reason (even if you don’t share specifics), and also that you’re acknowledging the extra they’ve given, it can make a difference to the way they feel about it. If the new supervisor does appear supportive and you do decide to address it with her, I’d suggest you put forward not only the problems but also some proposed solutions that would enable you to handle them better. Consider which elements cause you the most anxiety, and which you find easier to handle, and whether it’s logistically possible to shift some of the responsibilites around. Do you find it easier to handle detailed report-writing that needs intensive focus and keeps you at your desk, or client phone calls and meetings that are short and varied and break up the day? Do deadlines cause you extra anxiety, whereas the necessary tedium of data-checking (that everyone hates but has to be done) is actually quite manageable? Maybe you can reshuffle and switch out some of these things with your colleagues. One thing that can be great for your mental health but is very hard to do is to choose to take it slow for a while. It could be that for a 6-month period (and in consultation with your supervisor) you step off the corporate ladder, lower the standards you have for yourself, work fewer hours and hand over some responsibilities. It can enable you to take care of yourself, begin treatment, and come back refreshed and able to attack the climb once more – but for some I know the impact on career progression may be too high. My story is that despite knowing I had depression and being treated, I eventually worked myself to crisis point and had to take extended leave. On my return to work, my supervisor was highly supportive and in addition to allowing me a flexible schedule while I adjusted to being back in the workplace also had some suggestions for changes to my role that would benefit the department but take me away from the high-pressure areas. While I have had to accept my career progression will be slower, and to redefine my personal goals, my mental health is considerably better. The balance is different for each person, but I do encourage you at least to cut yourself a little slack and not to base your expectations of yourself on someone who is at 100% performance level. PS. Depression is often a taboo topic yet it’s amazingly common, and I chose to be open about it with people in my professional sphere for this reason. But I still worry it will reflect negatively on me in my future career. RAWR! The very first comment is a true gem. I’m with you TBK. If the sentence sticks (which I hope it doesn’t and has the opportunity to get challenged) I kinda hope the kid finds a Wiccan coven or Buddhist temple or something outside the expected (I imagine) Christian church to attend. If the condition requires that the teen goes to a particular church, a particular denomination (or excludes certain denominations), or a particular religion (e.g., Christianity) during the deferral period or indefinitely, yes unconstitutional as violating the Establishment Clause of the First Amendment or as being a Cruel and Unusual Punishment under the 4th Amendment. I think it’s also unconstitutional if the teen is unable to attend a preferred church because there isn’t one in his geographical area. E.g., if the teen wishes to go to an Orthodox Jewish Temple in a rural area where there isn’t a fitting house of worship within 100 miles. Or if there are a limited number of options available to the teen (e.g., in some towns there are only two churches). But, under a narrow set of circumstances, I don’t see a constitutional issue. That is, if the teen can choose a church, has a reasonable way of getting to the chosen church (e.g., does attending an online sermon or televised sermon count? ), and it’s only for a limited period of time. I would, of course, rather see a secular option, such as performing one hour of service per week instead of going to church. It’s a constitutional issue if you’re making someone go to a religious institution as a requirement for fulfilling a state obligation. Doesnt’ matter if it’s any church/temple/mosque of his choice–what if he’s an atheist? Some Universalist Unitarian congregations have atheist/agnostic groups. There are some humanist congregations (mostly in urban areas). No, a thousand times no. The state shouldn’t be able to compel attendance at religious services of any type, regardless of burdensomeness to the individual compelled. Woods, Elle nails it on the head: part of freedom of religion is freedom not to have a religion. Just as you shouldn’t be compelled to participate in a manner prescribed by the state in a religion you do believe in. This happened fairly local to where I live. The boy’s lawyer is very happy for this sentence. The official view on it is that it’s a way to give a good kid (who made one mistake) a second chance. Wow, I’m actually speechless. Isn’t the whole point of freedom of religion that you are free to not have a religion?! I take Karen’s point that it’s like a month or whatever but also maybe next time it will be two years or it will be ‘you have to go to x church’. Not cool. I think the fact that it was part of a plea deal (original article says that he pled guilty) takes care of any constitutional issues. You can probably agree to an unconstitutional sentence. Judges are sworn to uphold the law, including the Constitution. Why would it be appropriate for a judge to enter an order unconstitutional on its face simply because the defendant agrees? Moreover, doesn’t this raise concerns of state coercion? I might agree to attend church for a month if a prosecutor (the state) threatened me with jail time; that doesn’t make it right or constitutional. I am sorry Herbie, but this happens ALL THE TIME. Judges don’t have an obligation to prevent appeals from happening or needing to happen. It’s not about preventing appeals. It’s about upholding the law. Entering an unconstitutional order isn’t upholding the law, regardless of whether it gets appealed (which it won’t in this case). You’re right that the judge doesn’t have to make sure a defendant gets the best plea deal, makes a wise decision or even the right one. But whether a plea is the best deal a defendant could get is different than whether it’s constitutional in the first place. That just made my head explode as well. There is a reason why judges can use “community service” – same idea, no religion. Send him to his local community shelter to ladle soup once a week. This makes me RAWR too! If it sticks, I want him to find a Wiccan coven immediately! But what if he wants to go to church? I don’t get the church hate in this comment and mpls comment. I hope he becomes a wiccan if he wants to, or goes to church if thats the religion he chooses. I think it is good a kid who made a terrible mistake doesn’t have to go to jail. I agree that there is constitutional issues, but I don’t agree with comments like this against church. It’s not so much church hate as being opposed to the idea that the gov’t can compel you to attend religious ceremonies, which was the gist I got from the brief quote on the page. I have no problem with people attending church of their own free will, but I don’t think it’s the gov’t’s place to assign that to them – especially as a punishment. I’m a little less concerned if the defendant offered the church stuff as part of a plea agreement, but it’s still kind of squicky. That squick might be appeased if the order was for community service that could be satisfied by secular OR religious means. Although, if he WANTS to go to church (and is maybe going anyway?) how does that rate as punishment (if you subscribe to that theory of the criminal justice system)? My long-time wonderful assistant’s mother just passed away after a sudden illness. They were close. I vaguely remember hearing that flowers are actually not that great after someone passes because they die after a few days, making both a mess and a reminder of death. Is that right? What should I and the other people she supports do/send? I expect we’ll pool our resources to get something rather substantial. I’ve sent live plants instead of flowers, although the family still has to transport them back from the church or funeral home after the service. My secretary’s brother died a few weeks ago, very suddenly and at the age of only 55. He had finally just gotten a new job after a long period of unemployment and his family (wife and two teenagers) was strapped financially, so we gave money for funeral expenses, living expenses, whatever they might need. Is there a charity or cause that your assistant supports? You can always make a donation in their name. Some nice treats also might be kind since she will likely be managing visitors. Someone on here recommended middle-eastern pastries once that were outstanding and very easy to freeze without losing texture. Anyone remember the place? I sent some on several occasions and now the name is slipping. But other treats could be good, too. I don’t think there is anything wrong with flowers though. If they are sent to the funeral home or mass, they will help supply decoration. Seeing the visual display can be very comforting. That also allows the recipient to choose whether they want to bring them home or not. I don’t think flowers are a terrible idea, but I more appreciated donations to charity (my choice of charity, not theirs) in memory of the deceased when I was in a similar situation. Second the live plant in lieu of flowers. Flowers to the funeral; some gourmet food (Harry & David, Zingerman’s, etc.) for her when she returns home. breakfast basket during the time of need, and then bring over a casserole after 2-3 weeks. In addition to food, bringing over drinks is a nice thing. We really appreciated someone stocking the fridge with soft drinks, gallons of iced tea and lemonade when FIL died and we were having visitors to the house. I similarly cringed years ago when I heard that some pageant contestants have their bottom rib removed so they can have a smaller waist/torso measurement. If only they had started using a corset earlier and could have trained that rib inward! (Totally kidding, btw). friend of mine has very recently started seeing (by which I mean dating) a guy who works as a commission-based financial planner. He decided to use her LinkedIn profile as a means of developing potential clients. He identified me as a target and she did not tell him not to contact me (she told him not to contact certain of her connections, but I wasn’t so lucky). He called me at work today to set up a meeting, and although I do not want to meet with this guy at all I have ended up setting up a meeting with him for next week (apparently, “Oh, I’m crazy busy and have an unpredictable schedule, let’s try for January” is not a good enough way to blow someone off). Can I still back out of this? I understand the guy’s just trying to make a living, but I don’t want to do business with him for a variety of reasons (including that I think the situation is awkward, and if I were to seek financial advice, I would use a different institution which already manages some of my money). *cringe* yeah I would avoid that. For a stereotypical passive-aggressive approach, could you try “my father’s financial planner also manages my investments”? or, “the only investment money I have is from great-grandmother’s will and I use [bigname] financial firm at her request”? Yes, you can and should back out of this. It really bothers me when people in those sorts of jobs use aggressive sales tactics (and I think using your girlfriend’s linkedin profile to bother her friends counts as aggressive). You said in your post you do not want to meet with him and do not want to use his services. So, if you met with him it would be either (i) a waste of his time, because you’re not going to buy anything from him or use his services, or (ii) a waste of your money, if you let him pressure you into paying for things you don’t need. I would just call him back and say something like, “I’ve though about it some more, and I don’t think a meeting next week is necessary after all. I’m happy with my financial situation. Thanks for the offer, though.” He may come back with something like it would just be a meeting for him to tell you more about how he can help you, or you may not realize how your financial planning could improve, but I think all you have to do is repeat that you’re happy with your financial situation as it is. You can even say that you’ll keep him in mind if you change your mind in the future. Remember that he can’t make you do anything. Also, you may already know this, butit’s my understanding that fee-based financial planners and investment advisors are able to give more unbiased advice than commission-based ones, since their fee is the same regardless of what financial decisions you make (that is, they aren’t trying to sell you something). Ugh, this is so awful. You wouldn’t want to entrust your finances to someone so willing to steamroll you anyway. Are you communicating via email? I would send an email saying you’ve thought about it and you need to cancel the meeting, but you wish him well in his business. If he tries to argue or get you to change your mind, ignore him. These are horrible practices for both business and life. Yes, you can always back out. When these guys contact me, I just say “No thanks. I’m happy with my current financial planner.” I leave out that my current financial planner is, well, me. Once they know you are already “taken”, they give up pretty quickly. FWIW, if someone like this doesn’t back off after a polite “no thank you”, I feel 100% justified in hanging up on them (I might say “my client is on the other line gotta go”) and/or setting up an inbox rule to send their messages straight to trash (“oh, I never saw his messages, must be the spam filter at work”). *hugs* This is tough and I’m sorry you’re in this position. I would try honesty. I have been in a very similar position when a friendly acquaintance who’s an FA asked me if he could manage my money. X took it well. Because if he didn’t, it would have implied that he didn’t care about my friendship and only about making more money, which would have reflected badly on him. I was prepared that if X started making all sorts of extravagant promises like “I’ll never lose your money,” I’d remind him that by nature of doing that, he’s crossing a line ethically because you can’t really promise that you’ll never make any losses and that that alone is reason enough not to let him manage my money. But it didn’t come to that. Why not say something along the lines of your last sentence: “I already use a different institution which manages some of my money.” If you have no interest in his services, you are doing him a disservice by wasting his time meeting with you. I know you are tryin to be nice but you might be doing more harm than good. Plus, you will waste your own time hearing his pitch and he might ask personal financial Qs you might further be uncomfortable answering. Cancel. Do it through email if phone is too hard. (Also diminishes his ability to push back). Something along the lines of “I’ve given this more thought, and I’m really not comfortable with this.” That is enough. Any future correspondence should be: I’m not comfortable with this and would appreciate it if you don’t contact me further about it. Time is your friend. When you’re feeling put on the spot, simply say you need to think on it. Usually, that buys enough time that you can think of a better response or excuse to get out of whatever it is or the person lays off a bit. And whenever I’m kicking myself for not saying no in the moment, I’ve learned the best thing is to just say–“I’ve given this more thought and I’m not comfortable…” The “not comfortable” excuse is sort of one of those that people can’t keep arguing against because it is what it is. Don’t give any other info or explanation–doing so will only create openings for counterargument. Scratch everything I said in this thread. Heartily second what Double Boo recommends. I like this suggestion as well as the suggestions to say that you just aren’t interested. If your friend told him not to contact any of her connections, then I don’t think she would pressure you to take a meeting with him. I’d definitely cancel though. If you feel this guilty or concerned about backing out of the meeting and felt pressured into taking it, imagine what the result will be when you feel even more pressure to purchase something you don’t want. he makes a living making meetings like that and selling financial products that you don’t want–it might be awkward to back out, but wasting his time is losing him money. It seems less rude to just cancel. can anybody weigh in on the fit of skirts at NY & CO? I’m pear shaped, and do well with “curvy” fits in AT, Jcrew, etc. I’m usually a 10, but I sometimes go up to a 12 and get the waist taken in. I LOVE this sequined skirt from NY&CO (link to follow) but have never bought anything there…do I get a L or an XL? I would default to the XL but the one review says it is “heavy” because of the sequins…and I don’t want it falling off/slipping down. Most of my weight is in my stomach, but I’m a size 14 or 16 or XL (and actually probably starting to get into the L size now) at Ny & Co. My guess is that you’d be safe with a L since the top end of their size range is an 18 so I think the intent is that an XL would come closer to fitting that size. Sydney – just wanted to say that I know you have been working on getting to your ideal shape and size for a while now – you have posted about that before. It sounds like you are doing well! Are you just about there? Thanks Nonny! I’m getting closer. I actually had my doctor’s appointment yesterday, which was almost exactly 1 year from my first visit and I’ve officially lost 54.2 pounds this year. I have about 30 to go to get to a point where I’d be happy and within the “normal” bmi range, but I’d like to lose an additional 15-20 after that. Congrats! That’s a serious accomplishment and must have taken a lot of hard work. Thank you Be’More, I really appreciate it! Maybe I need to try it on. My weight is not at all in my stomach, and totally on my hips/thighs, which can get dicey with a pencil skirt with a stretch waist. You could always order both sizes and send me back. I’ve found them to be very good with my returns and I return a lot of stuff.